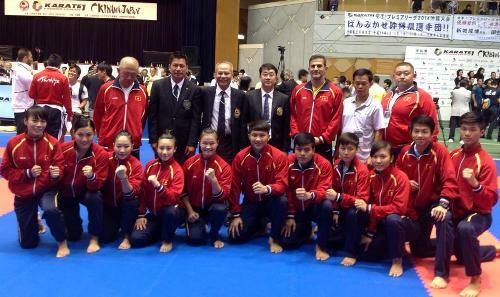 HA NOI (VNS) — The Vietnamese karate team, the only one to win a gold medal in three successive Asian Games (ASIAD) tournaments in recent years, could return home empty-handed this year. This is largely because most of the seven-member team to be sent to the ASIAD in Incheon, South Korea are rookies. The veterans have been sidelined by injuries. Another factor is the change in the coaching staff. After 13 years at the helm, Le Cong, the head coach, was replaced last March by Sayed Hassan of Iran. While Hassan is expected to bring the team to new heights, he is still adjusting to the athletic training process in Viet Nam, as well as the training style of Cong, who handled the team for more than a decade. After more than a month under Hassan, the team made a remarkable transformation by winning 14 gold medals in the ASEAN championships in Can Tho Province, outperforming the competition from powerful Thailand and Indonesia, which each won only nine gold medals. Vu Son Ha, head of the National Sports Administration's Karate Department, said Lim Chee Jin, chairman of the Asian Karate Federation Referee Council, was deeply appreciative of Viet Nam's performance. Ha added that Vietnamese martial artists had adjusted well to technical and tactical changes and showed remarkable improvement in their physical strength and movements. Hassan said some of the athletes on the team felt nervous about ASIAD because it would be their first time there. "However, they need to remain calm and have strong self-control for a chance to win," he remarked. The Iranian coach noted that nearly all Vietnamese athletes were trained using the same method. When he took over, he had to study the character of each athlete and provide them with individualised exercises that would improve their strengths and neutralise their weaknesses. Nguyen Hoang Ngan, the former world champion, bears on her shoulders the heavy task of winning the gold medal in the kata (performance) category at the Incheon ASIAD. Ngan, who recently won a gold medal at the Karate1 Premier League in Istanbul, Turkey, is the only Vietnamese karate expert to reach world levels. She has undergone deep training in Japan in recent years. However, at the ASIAD, considered a mini-world championship, she will be facing her top rivals on the world stage, from Japan, home of the sport, as well as Iran and China. Though she has won a number of titles in various world tournaments, she has yet to win in ASIAD. "I only took a silver at the 2006 event and did not take part in the 2010 edition. I will be the one who will be looking forward to ASIAD the most," said Ngan. "It is difficult to say if I could win a gold, but I will go for it." "Ngan is our hope," said Ha. "We know that the competition will be tough, but we believe she will play her best." On the kumite (combat) side, the absence of fighters Vu Nguyet Anh and Le Bich Phuong, former ASIAD winners, has left a big hole in the team. The years are beginning to catch up with Anh, 30, who was on top of the podium in Qatar in 2006. On the other hand, Phuong failed to stay in shape for the tournament and will be missing it for the second time. Ho Ngoc Thuan, Lang Thi Hoa and Bui Thi Han will be making their debut in South Korea. One small advantage is that they know who they will be facing, and they have been preparing for the moment. "I have done much research on my rivals. I looked at their style and strong points. I also prepared myself and will follow my coach's instructions during the competition. I hope to achieve a good result," said Thuan. For her part, Hoa revealed that she lacked international experience but didn't feel under heavy pressure to win a medal. This, she said, could be the advantage that will enable her to "perform magic" in Incheon. Han, 17, has travelled to compete for medals in tournaments held in other countries in the last four months. Her remarkable results have made her one of the coaches' choices for the national team. "It is an honour and a big challenge in my career. I promise to achieve the best result possible," said the athlete.